We have just bottled up 10 litres of ‘Elderflower Champagne’ and are waiting nervously for it to mature, or explode, whichever comes first. It certainly smells the part and was not really any trouble to make. I am quite amazed that it is possible to make a mildly alcoholic delicious drink within 2 weeks with nothing but hedgerow gatherings, 2 lemons and a bag of sugar. 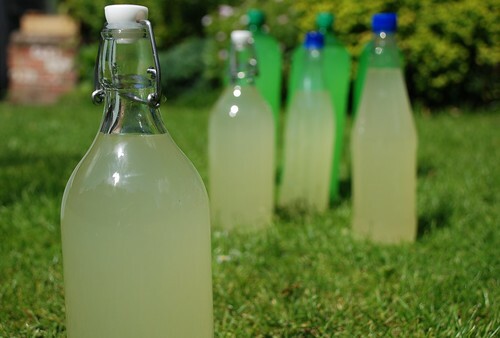 We are planning to head off into the fields shortly to get some more elderflowers to make cordial too from a recipe in Celia’s Blog, if we can get hold of some citric acid. I followed Celia’s tip on using a new stocking to strain the champagne. There seems to be lots of online debate about elderflower champagne since Hugh FW made it on River Cottage Spring last year. Something about incorrect ratios of sugar and lots of people with glass that got embedded in awkward places and very sticky garages. Because of this I followed a Hugh Free ‘recipe‘ that I found. I felt it was early days to invest in lots of lovely glass bottles just yet, so I got a couple from Ikea then collected a motley crew of plastic bottles from our ever growing recycling pile. The neighbours must think I am quite odd, traipsing out in the garden to photograph old bottles, bread, cakes, dogs. Meanwhile ‘The Things Ed Makes’ are slightly less photogenic. He is down a big trench at the back of the house trying to make our home a bit more waterproof.